Home > Unlabelled > The BRIDGE Dinner Is Here! The BRIDGE Dinner Is Here! 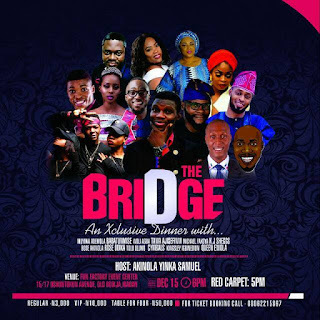 THE BRIDGE is a dinner event which it's aim is to bridge the gap between those that are made and those that are in the making. So, we(the hosts) are like the intermediary between these people. We want to create a common ground and that we will do! And so we have been able to sort through different industries and decided to host a few of them that are doing well in what they do. We have the likes of Muyiwa Ademola, Bose Akinola, Rose Odika and Tawa Ajisefinni from the Nollywood industry, The Cymbals Dance drew from the 'Dance Industry' and so on. This event is holding on the 15th of December, 2017 at Fun Factory, Ibadan by 5pm. And several other special appearances. For Sponsorship, Advertisement and Ticket booking, contact 08062215867 or 07062887958.